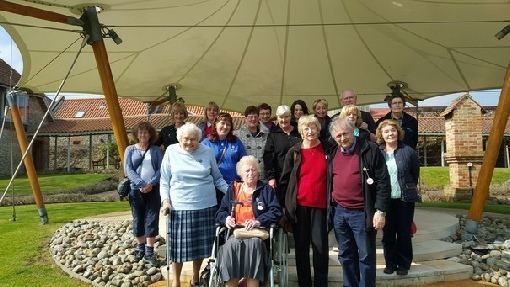 Our Walsingham Pilgrimage weekend this year was from 1st to 3rd April. We set off from St George’s at 7.30am with our coach making one other pickup at Rowlands Castle. We had a coffee break at Birchanger Services and stopped for lunch at Newmarket, where apart from eating there was just time for my friend Jennefer and I to buy a jumper in EWM’s sale as we passed by on our way back to the coach! There were no major traffic delays and we arrived at Walsingham in good time to settle in and unpack before our first service at 4.45pm. Fr Mike always tells us that we are free to go to or miss any of the services and to enjoy our time at Walsingham as we wish, but when I read through the list I never want to miss anything and try to get to them all so it’s a busy but still somehow quite relaxing three days. On Saturday morning we walked to the Catholic Shrine, looked around, browsed in the shop and had our traditional hot chocolate in the cafe. That afternoon my husband and I caught the local bus to Wells-Next-The-Sea. The sun was warm and we had a long walk and then a beer sitting on the deck of a rather wonderful old boat converted into a restaurant/bar whose rickety chairs and trip hazards made me wonder how it had ever passed its ‘health and safety’ assessment! In the evening was the Shrine Eucharist, supper and then my favourite service with the outdoor candlelit procession. The weather was not so good for this, but by the next morning was really warm and we packed away our fleeces and waterproofs to put onto the coach after lunch. Sunday afternoon we had the Sprinkling at the Well, the Laying on of Hands and Anointing and Procession around the Shrine gardens, before the Last Visit and heading back home. Our weekend Pilgrimage to Walsingham is always hectic, enjoyable and also a very spiritual time. The Annual Parochial Church Council and Parish Lunch took place on Sunday 24th April. After electing a new Churchwarden and PCC Members we all adjourned to the church hall. The helpers had arrived early each carrying a large bowl of salad; large pans of soup were simmered on the stove, baked potatoes cooked in the ovens, and assorted cheesecakes and gateaux were plated into 60+ portions. We were handed a glass of sherry as we arrived and enjoyed tomato soup, cold meats and salad, dessert, red or white wine, coffee and mints for our meal. Then there was just time to finish the dishwashing before Evensong which Fr Mike held in the church hall. As the weather was expected to be wet, the “Saturday Bandstand” transferred from the Precinct into St George’s Church on 21st May. Lauren, Sue and Charlotte from CCADS Theatre (The Corpus Christi Amateur Dramatic Society) entertained us with Songs from the Musicals. CCADS Theatre will be performing “Into the Woods” at the Ferneham Hall, Fareham, Thursday 16th to Saturday 18th June. 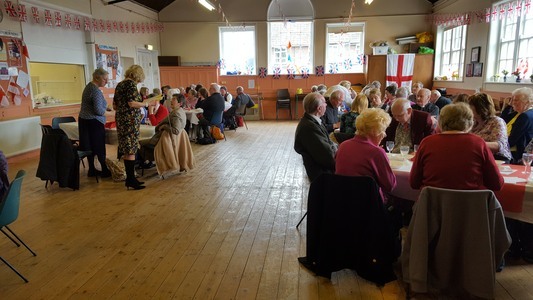 About 25 people “Wine Tasted” in St George’s Church Hall on Saturday evening, May 21st. There were six wines to sample, 3 white and 3 red. We were asked to decide on their country of origin, grape variety and cost, and also to rate them as to how we enjoyed them. A “wine themed” quiz, with multiple choice answers (to which I guessed the answers and even managed to get some right!) was on each table to try if we wished. During the evening a ploughmans supper and teas and coffees were served. £187 was raised for Church funds. our, by now, crowd of people walked through the Friday Market to St George’s to finish our service outside. At 2pm the “Solemn Liturgy”, again in four parts: The Ministry of the Word including the Reading of the Passion, The Veneration of the Cross, The Intercessions of the Church and the Ministry of the Sacrament. After each service hot cross buns and hot drinks were served in the church hall.